It's that time of year again - Christmas time! As well as the big day itself, there are usually a whole host of events happening in the run up and afterwards too, making it party season! Therefore, it's time to pull out your party proof makeup. Luckily, today I have an item to review that claims to be just that. It's the name of the product and everything! ModelCo's Party Proof Lipstick claims to be an ultra long-lasting lipstick that provides a super vibrant, semi-matte finish colour. It comes in a range of 17 shades that promise not only to be party proof, but drink proof and kiss proof (pucker up!). 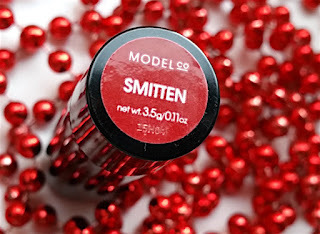 Today I have the shade Smitten to show you, which arrived in my December Birchbag (sign up to Birchbox here! This months comes with a pretty, sparkly clutch bag!). It is a beautiful, dark, cranberry red shade. This particular one that I have comes packaged in a sleek, black tube which is the limited edition packaging rather than the usual white, rectangular tube. You can apply straight from the tube for a casual look, or apply with a lipstick brush for a more refined look. I recommend that you also blot this lipstick after application. More on this further down. 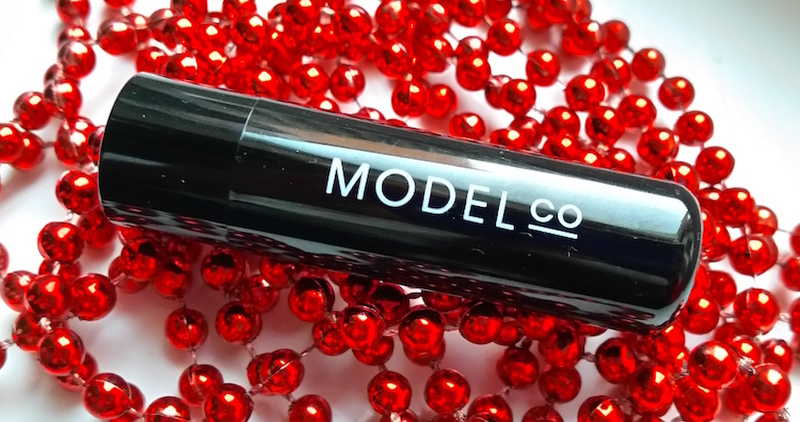 The ModelCo Party Proof Lipstick applies smoothly and is quite creamy, but it dries down to a semi-matte finish. The colour is really vibrant and is opaque too, so no need to build it up. This lipstick definitely stands up to its claim. It’s long lasting, and doesn’t need many touch ups. However, you definitely need to give it a blot (the photo above was taken without blotting, but the colour is the same). Blotting gives it an extra matte finish that really adds a whole new depth to it, but it also plays another vital role. "What is that, then? ", I hear you ask. This stuff transfers to things MEGA easily. If you are wearing this lipstick to a party or on a night out, I recommend using a straw, otherwise you may have more lipstick around your glass than you have actual drink inside of it (yet again, I guess it’s a surefire way to know exactly which drink is yours). It's pretty funny because the product description on the Birchbox product page explains that you can go to a BBQ and it will "stay put through burgers and ribs, champagne toasts and beyond", but I tried to eat a sandwich with it on and it was a disaster. I couldn't work out if my bread was white or red. Not only that, but my mug looked a right state after drinking my cup of tea whilst wearing it too, almost as if my mouth was bleeding (it wasn't). You know what though? Even with all the transfer, it was still there on my lips. It was still going strong. It was if the transfer didn't even do anything, and that's pretty great. Blotting does help somewhat with the transfer and makes it bearable, but it doesn't totally eliminate it. This does lead onto the question about removal though. Sometimes long-lasting products can be a nightmare to get off at the end of the day. I use micellar water to remove my makeup and I had no trouble removing this lipstick at all. Overall, I do like this lipstick, and ModelCo are right in saying that it is long-lasting. However, I’m not entirely convinced that it is totally “party-proof”. The "go to a BBQ! ", "drink champagne!" stuff on the Birchbox site does leave me scratching my head and wondering if they’ve actually tried doing these things whilst wearing this lipstick themselves. Yet again, like I said, it does actually stay put. I think it is more of a transfer issue of excess product (even though I don't go overboard with it), making it messy through eating and drinking particularly (and kissing, of course). Putting that aside, if you are looking for a long-lasting lippie that is vibrant and semi-matte, you don’t need to look much further than this. 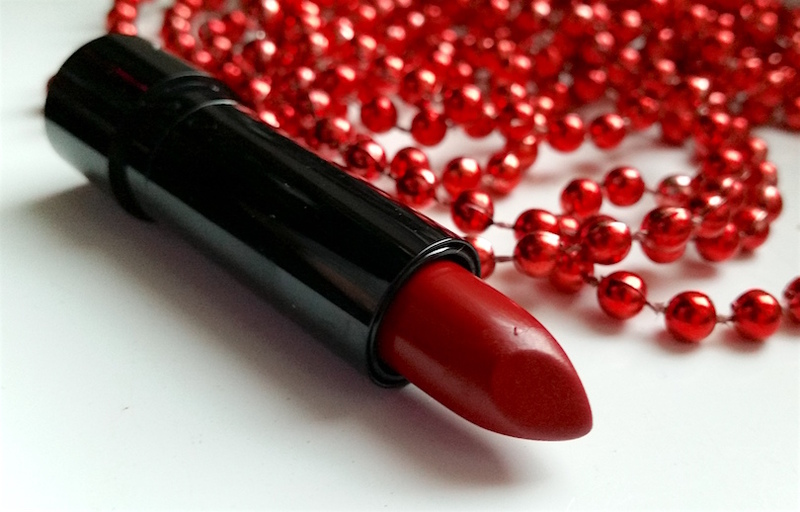 If you need one to get you through a dinner date and you don’t mind forking out a bit more for it, then I recommend the fellow Aussie brand Mirenesse’s Mattfinity Lip Rouge. It is far more eating-friendly. You can purchase the ModelCo Party Proof Lipstick Trio for £15.50 from Birchbox (it contains the shades Smitten, Stiletto and Kitty) or the individual ModelCo Party Proof Lipstick's from £12 at ModelCo. 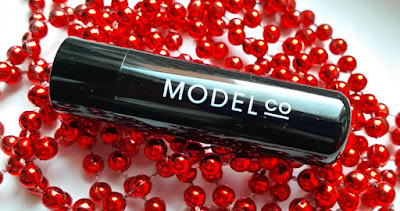 What are your thoughts on the ModelCo Party Proof Lipstick? What is your favourite long-lasting lipstick?